29 programmable buttons with 87 functions all within the reach of a single hand. 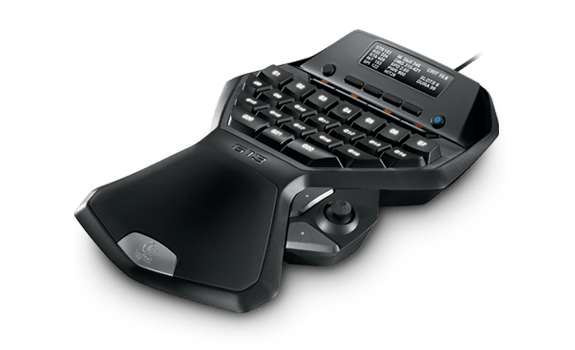 The G13 features 29 programmable buttons placed in an incredibly comfortable ergonomic design. At a quarter of the size of a traditional keyboard, the G13 was created so every keypress needed was within reach. Most PC gamers know that Logitech makes great gaming accessories from mice to keyboards to gamepads. We recently reviewed the G710+ mechanical keyboard and fell in love with it and it’s responsiveness but sometimes a gamer needs something a bit more specialized and compact. That is where the G13 Programmable Gameboard comes into play. The G13 features 29 programmable buttons placed in an incredibly comfortable ergonomic design. At a quarter of the size of a traditional keyboard, the G13 was created so every keypress needed was within reach. The Gameboard is about 7″ by 10″ and sits a bit higher than normal keyboards due to the wave-like design. It feels heavier than it really it coming in at 1.3 pounds and like most respectable electronics, the G13 features rubber feet that keep it in place even during more vigorous gameplay sessions. A single 7 foot USB 2.0 cable connects it to the computer giving gamers plenty of extra cable. A wavey design that fits the contour of fingers. As mentioned the G13’s design looks a bit like a wave from the side and it is pure genius. Arching up is the palm rest and it can be considered the base of action for the G13. 22 keyboard like G keys slope down from the palm rest placing the keys at just the right height for pulling the fingers back to hit the closer keys without having to move the palm on the rest. It is surprising how comfortable it is to minimize hand movement to the fingers during long play sessions. A backlit LCD display tops the G13 off and displays a variety of information from apps like cpu and ram usage, stopwatch, and a RSS reader. Some games like World Of Warcraft even display your character stats on this screen. Apps can be added and removed via a LCD management program from Logitech allowing users to snag third-party apps or program their own if they have the ability. Each of the 3 memory profiles can be assigned a color in the key profiler that will change the LCD and 22 G keys backlighting to match. The color choices run the full gambit of the 255/255/255 RGB scheme. The downside is that not many people are going to be looking away from the monitor to see the information on the LCD screen. Niche? maybe. Comfortable? heck yea. To utilize the G13 properly, the Logitech G-Series Key Profiler and LCD Manager must be installed along with the drivers. The key profiler software scans for games and grabs default presets for recognized titles but also lets users create custom profiles and assign keystrokes, macros, scripts, and functions to the keys on all 3 memory profiles. It provides a lot of functionality for basic users but pro users will definitely benefit from the scripting. The G13’s onboard memory will store profiles so the device can be moved from pc to pc without having to reconfigure. The great thing about the G13 though is that you don’t have to stop in the middle of the game and go to the key profiler if you think of a great macro. On the fly macro recording allows you to assign a G key a set of keystrokes. Some might deem the G13 to be an unnecessary accessory marking it as niche but it offers a level of comfort and control not found in traditional keyboards. Between the software and on the fly macro recording, the G13 gives gamers a high level of customization that fits in smaller workspaces. The joystick could use improvement but outside of that it is hard to see how the G13 could be a better product.